Did Hillary Clinton Buy The Endorsement Of The New York Times? 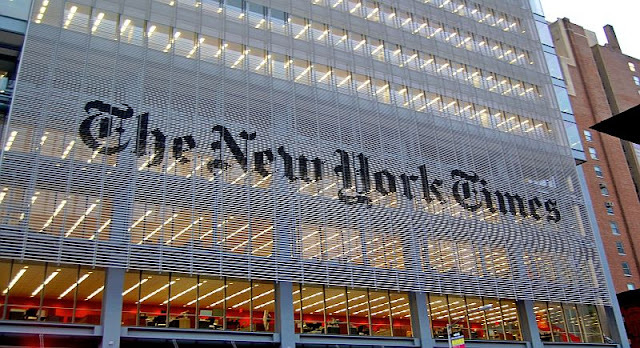 Did Hillary Bribe the New York Times to Get Their 2008 Endorsement? We’ve been hearing about everyone and their brother paying the Clintons for access, support, arms, and special State Department favors. The list keeps growing and growing. But, on the other side of the coin, we are now starting to hear about people and organizations the Clintons are paying for various favors. (Free Beacon) – A little-known private foundation controlled by Bill and Hillary Clinton donated $100,000 to the New York Times’ charitable fund in 2008, the same year the newspaper’s editorial page endorsed Clinton in the Democratic presidential primary, according to tax documents reviewed by the Washington Free Beacon. The Clinton Family Foundation, a separate entity from the Bill, Hillary and Chelsea Clinton Foundation, has been the family’s vehicle for personal charitable giving since 2001. It is funded directly by the Clintons and distributes more than $1 million a year to civic and educational causes. The New York Times Neediest Cases Fund is a charity affiliated with the newspaper that assists underprivileged New Yorkers. It is run by members of the New York Times Company’s board of directors and senior executives. At the time, there were reports that the Times board had leaned toward endorsing Obama, but was overruled by then-chairman and publisher Arthur Sulzberger Jr., whose family controlled the paper. Sulzberger’s cousins and Times Company directors, Lynn Dolnick and Michael Golden, chaired the New York Times Neediest Cases Fund in 2008. The Clinton Family Foundation did not list the specific date the donation was made in its public tax disclosure forms. Neither the Times nor a representative of the Clintons responded by press time to a request for comment. And, as teaparty.org reveals, the Clintons’ donation to the Times’ charity was much larger than their usual donations to other organizations. The CFF’s $100,000 contribution to the New York Times Neediest Cases Fund is larger than its typical donations. Of the 47 organizations the CFF donated to in 2008, only six groups received more than $50,000. Most received between $2,000 and $25,000. The CFF has not donated to the Neediest Cases Fund since 2008. Vanity Fair also reported that May that Sulzberger intervened in favor of Clinton after he was lobbied heavily by one of Clinton’s top financial backers. “The Times editorial board was, apparently, planning to endorse Barack Obama in the New York primary; the Clinton campaign, getting wind of this, called upon one of its major financial supporters [Steven Rattner], the best friend and principal adviser of Arthur Sulzberger Jr.,” Michael Wolff wrote inVanity Fair. The CFF’s largest contribution in 2008 was $1,000,000 to the Bill, Hillary and Chelsea Clinton Foundation (then named the William J. Clinton Foundation). The donation made up nearly half of the $2.4 million the foundation dispersed that year. The CFF’s donations to the Bill, Hillary, and Chelsea Clinton Foundation continued to dwarf its other distributions between 2009 and 2013. The Clintons gave their higher-profile foundation $352,000 in2011, $220,000 in 2012 and $300,000 in 2013. Yep, the biggest donations the Clintons made were to themselves – moving money from one of their “charitable” foundations to another one they control. Apparently, the Clintons have the Jerry McGuire philosophy when it comes to charity – “Show me the money!” And, that includes showing others “the money” to get the favors they need at the time.